Get caught providing aid to Hamas and you'll find yourself hauled into federal court where a lengthy prison sentence awaits. Win elected office in Egypt as part of the Muslim Brotherhood's political party – the parent organization of Hamas – and you'll find yourself flown to Washington to be feted by academics and government officials. Such is the case on April 4, when an "Official delegation of the Egyptian Muslim Brotherhood (MB) and its Freedom and Justice Party (FJP)" is slated to visit Washington, D.C. at the invitation of Georgetown University's Saudi-funded Alwaleed Bin Talal Center for Muslim-Christian Understanding. The visiting Egyptians, whose party won strong pluralities in recent parliamentary elections, also are expected to meet with U.S. government officials. Although Georgetown quickly sent out an updated invitation to the event declaring that the MB would not be in attendance, it does not change the fact that the FJP is the Muslim Brotherhood. A few Copts have been interspersed in the group's leadership, the bulk of those setting the party's agenda and the agenda itself are Brotherhood. The FJP is a new political player in Egypt, but its support for terrorism and violence is indisputable – which is perhaps the reason for the duplicitous invite from Georgetown – promote the FJP while distancing it from its real roots and MB agenda. The invitation seems to fly in the face of Hamas' strong relationship with the Brotherhood and the FJP. Hamas was created as Brotherhood offshoot. The group reinforced that connection in December by declaring itself "a branch of the Muslim Brotherhood – Palestine." "Our alliance with the Brotherhood threatens the Israeli entity," Ismail Haniyeh, the Hamas prime minister in Gaza, said in December during a visit to Cairo. Brotherhood leader Mohammed Badie said his group viewed Hamas as a role model and "has always embraced issues of liberation, foremost the Palestinian issue." In an August interview with Radio Free Europe/Radio Liberty, FJP Vice Chairman Essam el Erian called Hamas a "resistance group fighting for freedom and liberation of their lands from occupation." He also stated that "the West must revise their knowledge about Hamas, [so] that war and terrorism will come to an end. And mixing cards and putting [designating] Hamas and other resistance groups among terrorist groups, this was a fatal mistake of the West." Support for Hamas has been illegal in the United States since 1995, when President Bill Clinton signed an executive order decrying "grave acts of violence committed by foreign terrorists that disrupt the Middle East peace process" and threaten American national security. In addition, the United States has had no formal dealings with the government in Gaza since Hamas took control there in 2007. But the Brotherhood/Hamas connection does not appear to be a consideration in granting the FJP members visas to visit the United States. Nor does FJP's rhetoric, which often is hostile toward the United States and its interests. For example, we have not granted visas to other political organizations like the Jordanian Muslim Brotherhood or their South Asian equivalent Jamaat-e-Islami, despite their strong role in their nation's civil societies. "It is no secret that the events of contrived sectarian strife and the numerous security breaches which occur from time to time in Egypt, in an almost organized and suspicious form, are unequivocally masterminded through the work of intelligence by the United States and Israel," claimed an October article on the FJP website. The piece goes on to blame a secretive "Western and Zionist intervention" that would not "leave the Egyptian revolution alone or let the Egyptians enjoy their revolution, which affects their [American] interests in the region, without ruining their [Egyptian] lives for them!" The administration has chosen to ignore remarks like those, in favor of the ones they want to hear. By January, the FJP was singing a different tune to visiting American officials, promoting better relations between the United States and providing them with an overview of their political plans. Some Egyptian papers even claimed that the United States would help the FJP develop an economic program to secure the country and to keep the Islamist party in power. 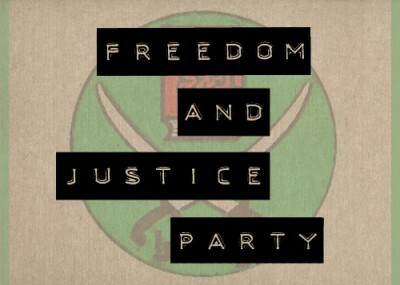 Most of the hateful and violent rhetoric of the FJP is regurgitated from the 80-year-old ideology of the Egyptian Muslim Brotherhood, which formed the party. Just as the MB often says one thing in English and another in Arabic, the FJP has followed suit by saying the right things to American visitors and something completely different to party members and average Egyptians. As the largest party represented in Egypt's parliament, the FJP will be the dominant coalition partner for any future Egyptian government, giving it enormous weight in shaping Egypt's new constitution and future. - "continuing intellectual and psychological preparation to encourage Jihad and awaken a desire for it." - "the imposition of compulsory conscription on all the youth of the nation and training them in the latest types of weapons." - "Affirming the rights of the Palestinian people to liberate their land, and highlighting the duty of governments and people of the Arab and Muslim countries, especially Egypt, to aid and support the Palestinian people and the Palestinian resistance against the Zionist usurpers of their homeland." - "Providing all means of support for the Iraqi people until the last soldier of the U.S. occupation departs, until Iraq's national decisions are free from foreign interference, until Iraqi safety and territorial integrity are secured, and until Iraq is rid of violence and sectarian strife." The platform also gave FJP's reasons behind its support for terror, by blaming Egypt's current weakness on supporting the United States' vision of the Middle East. "Indeed, Egypt turned against its own history and powerful potential. It started supporting occupiers and colonizers, through its presence in the so-called axis of moderation, which is sponsored by the United States," the document stated. "Egypt laid siege to resistance, freedom-fighters and revolutionaries. Hence, our program seeks to restore glory and leadership and status to Egypt, under the banner 'Indeed, this nation of yours is but one nation' [Quran Chapter 21, Verse 92]." The FJP has also met with Hamas several times and advocated for them abroad. "I want an office of the Palestinian resistance movement Hamas to be opened in Cairo and I would very much welcome it," FJP Chairman Muhammad Mursi said on Feb. 29. "Support for the Palestinian cause is a duty upon us [which] we will discharge. In fact, the Egyptian role for Gaza and Hamas after the revolution is a distinct one." The FJP's website even carried an article about how the party's secretary Mohamad Katatni preached violence against Jews last August. At the demonstration, the crowd roared chants of "Khaybar, Khaybar, oh Jew, the army of Muhammad is right here," and "Patience, patience, Jews. The Egyptians will dig your grave." Katatni told the demonstrators, "The Egyptian revolution represents the beginning of the end of the Zionist entity, stressing that the strength of Islam is only one capable of eliminating the Zionist entity and liberating Palestine." Where the Jews had defeated the Arabs time and again in pre-Islamic times, he claimed, Islam provided a new strength. "The Arabs were only able to defeat them after Islam came, and the Arabs and Muslims began to confront the Jews with the strength of faith," he told the crowd.